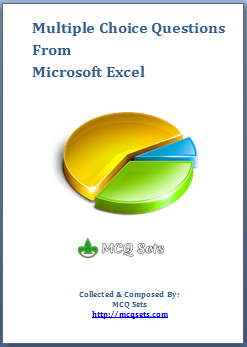 Click the link towards the bottom of this post to Download MS Excel MCQ Bank by Suresh Khanal. MS Excel carries heavier weigh in Computer Operator Syllabus by Public Service Commission and Excel is one of the decisive topics in most of the competitive computer jobs exams. Out of 50 marks for Data Entry Supervisor Examination, MS Excel occupies 10 marks which is 20% of the full marks. Thus a thorough knowledge of spreadsheet calculation concept and confident in skill to operate MS Excel is well expected from anyone competing for Computer Operator job. Excel is a powerful application not only spreadsheet calculation, but it is equally useful in moderately sized database management as well as in charting and graphs. Once you know how to use Excel, it proves to be a great tool to analyze data and supports you in decision making. Data summarizing tools, what-if-analysis tools are always praised when it comes to glancing at data to bring out an informed decision. Here I composed and compiled a collection of multiple choice questions from Spreadsheet Calculation concept and MS Excel. The questions comply to the Computer Operator and Data Entry Supervisor Syllabus prescribed by Public Service Commission. This MS Excel MCQ Bank is equally useful to any examination from the boards such as NEA, Nepal Army, Provident Fund, Bank PO exam and so on. Download this MS Excel MCQ Bank and don't forget to leave your feedback if you find it useful to prepare for your exam. Share this post on facebook, twitter, google+ is highly appreciated.